MiniTool's Partition Wizard is a highly competent partitioning toolkit that experienced users should have little difficulty getting up to speed with—largely because it looks and feels just like a half dozen others: toolbar, list of functions to the left, and a pane with drive information to the right. While familiar, the interface is particularly focused in its approach and exceptionally easy to use for basic operations. Good for the less experienced. However, its interface approach to some advanced operations such as merge and re-size could use a bit of work. Partition Wizard supports all the latest partition technologies such as Windows dynamic disks and GPT. As with most programs of its ilk, it queues commands such as convert (FAT to NTFS or vice versa), delete, merge, split, and wipe, then applies them all at once. Not only does this allow hands-free implementation of multiple commands on multiple drives, it allows you to review your choices—always a good idea when you're doing things that can kill data. I've always wondered why partitioning tools force you to open a standalone command prompt to run Microsoft's own chkdsk.exe—still the best disk-checking utility for Windows outside of dedicated recovery programs. 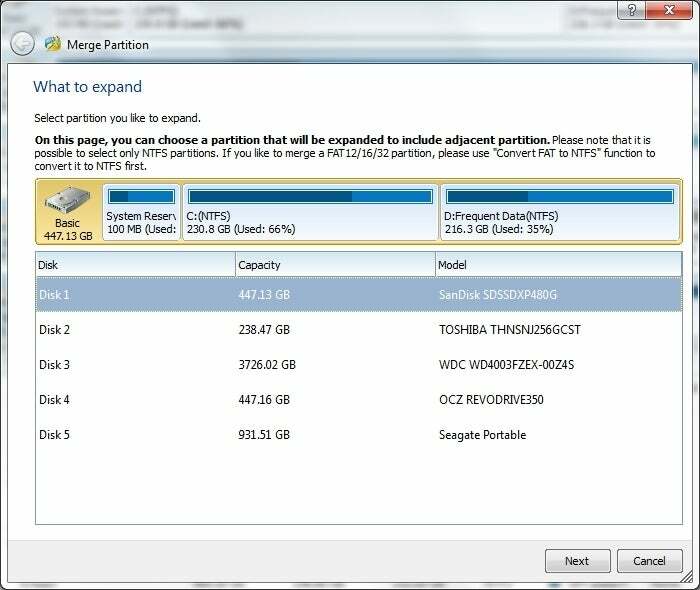 Partition Wizard scored immediate points with me by running it seamlessly within the program. There's also a separate surface test, a file explorer (view-only), and a secure wipe utility. I was hoping MiniTool might also support invoking a drive's own secure erase function and/or force TRIM on SSDS, but it doesn't. While not strictly partition related, those commands would make the program a one-stop shop for everything storage-related. Just sayin'. 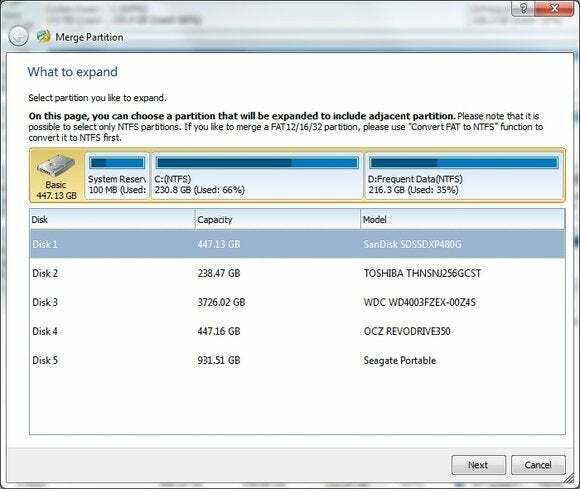 Partition Wizard's outstanding aspect is not its capabilities, which are largely mirrored in other programs, but how easy it is to use for basic operations. While the application provides wizards for copying and recovery, most other operations are done via a single dialog with easy, intuitive controls. But the program makes a couple of minor missteps with some advanced operations. Partition Wizard's Linux-based boot CD looks and functions exactly like the Windows version. First off, you must to open a separate dialog for every partition on a disk you'd like to re-size, where most programs let you re-size them all at once. But the merge dialog was the real issue. Where most of the time the program operates on the partition you've selected in the main window, for some reason the merge dialog comes up with a list of all the drives with the first drive in the list selected, no matter what's selected in the main window. If you have two similar disks on a system, you could very well wind up operating on the wrong one if you're not paying attention. Merging isn't generally dangerous, but still. Despite those minor issues, Partition Wizard easily passed muster in actual operation, performing each action without errors or issues—even re-sizing and moving, which are traditionally time consuming. I only moved a couple of gigabytes of data and used a very fast OCZ Revodrive 350, but everything went off without a hitch and in short order. While most Partition Wizard dialogs present only the disk/partition currently selected in the main window, for some reason the merge function presents them all and always selects disk 1. This could be an issue if you're not paying attention. 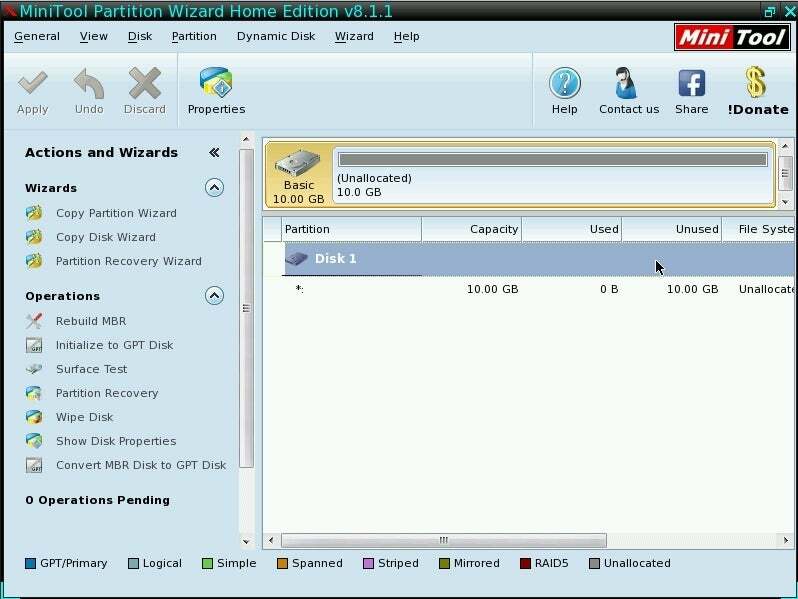 Partition Wizard ships as a free home version that will take care of most user's needs (as will Windows own integrated partitioning tools to be honest), but there's a $39 professional version that provides advanced capabilities such as aligning and merging partitions, changing cluster sizes, changing the type ID, and the aforementioned support for dynamic disks. Additionally there are $129 Server (works on servers), $399 Enterprise (may be used throughout a company), and $699 Technician (use anywhere) licenses available. If diskpart.exe and the Windows disk manager aren't cutting it for you, or you want an easier, more comprehensive tool, then by all means download MiniTool Partition Wizard and take a look. The free version is fine for the basics, and the $40 Pro version compares well to the $50 Acronis Disk Director 12. It does, however, lack the virtual hard drive support featured by Paragon's $80 Hard Disk Manager Professional 14. A highly capable partitioning toolkit that compares favorably with more expensive rivals.